Studio 24 Collection. A flat glass covers the entire front of this contemporary wall clock, which features a Wenge look black coffee finished back panel with brushed nickel finished accents. 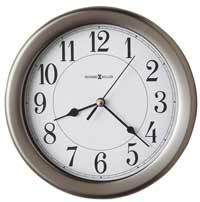 The white dial offers raised markers and straight hands, all with a brushed nickel finish. The cylindrical swinging pendulum is finished in brushed nickel complementing the dial. Accurate Quartz, battery operated non-chiming movement operates on "AA" batteries. 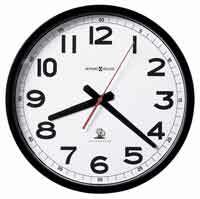 Clocks for sale at The Clock Depot including the 625-401 at discount prices.